High energy prices affect nearly the whole of the American population, arguably affecting some consumer groups more than others. 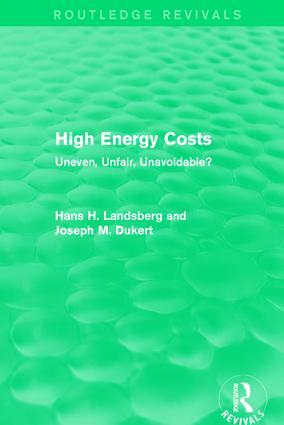 Although originally published in 1981, the issues explored in this study such as who is affected most by energy price increases, regional differences and what can or should be done in the United States in regards to energy costs are still as relevant today as they were then. These papers attempt to directly address these concerns in the wake of the 1979-80 price shock in America and to advise what action can be taken to allay these concerns. This title will be of interest to students of environmental studies and economics.